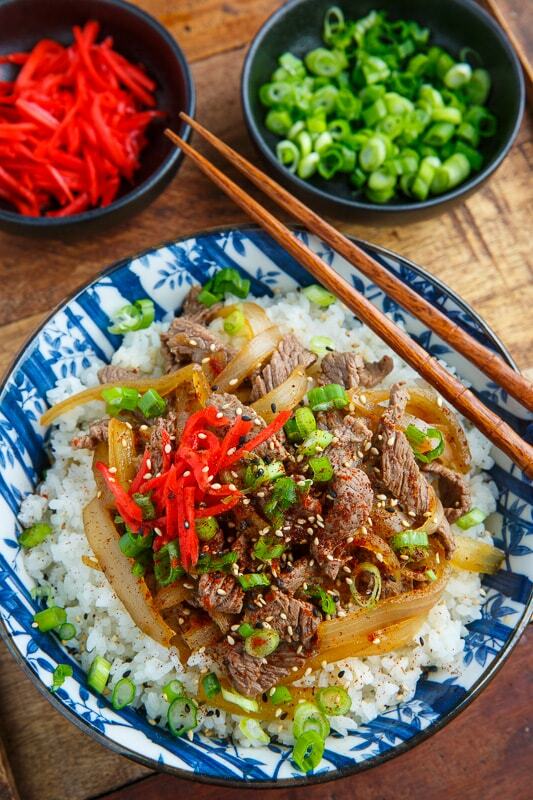 Quick and easy Japanese style beef rice bowls that are just packed with flavour! 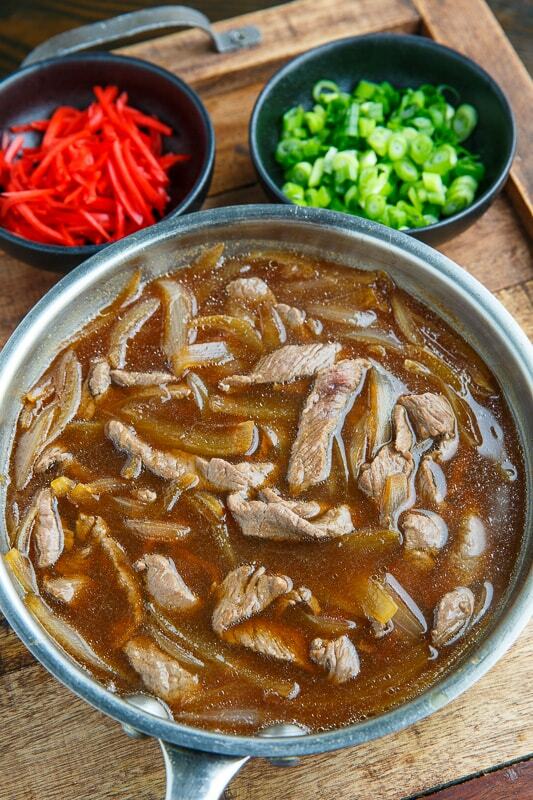 Gyudon (牛丼), short for gyu donburi, or beef rice bowl, is a Japanese dish consisting of beef and onions on a bowl of rice. In Japan gyudon is fairly common and might even be considered a type of fast food with several large chains that specialize in it such as Yoshinoya and Sukiya. I made sure that I tried the gyudons at both Yoshinoya and Sukiya when I was in Japan on vacation (years ago), I enjoyed both of them and this is my favourite homemade version! You basically simmer onions in a broth seasoned with soy sauce, mirin and sugar until the onions are tender before adding the beef and cookinguntil the beef is just cooked before pouring it over rice in a bowl. 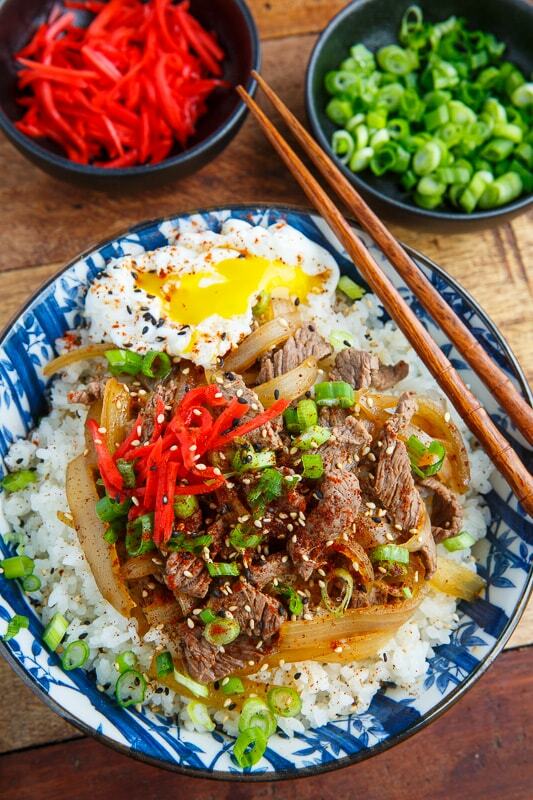 These beef bowls are so easy to make at home, taking less time than it takes to cook the rice, and they are so good! Add a poached egg with runny yolk! Bring the rice and water to a boil in a small sauce pan, reduce the heat to medium-low and simmer, covered, until the water has been absorbed, about 20 minutes. Meanwhile, bring the broth, onions, soy sauce, mirin and sugar to a boil, reduce the heat and simmer until the onions are tender, about 2-3 minutes, before adding the beef and simmering until just cooked, about 2-3 minutes. 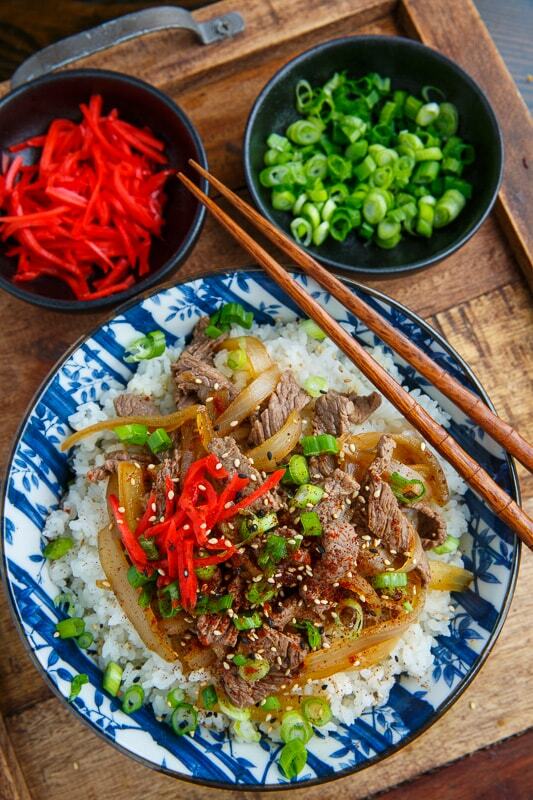 Divide the rice between four bowls and top with the beef and onions garnishing with green onions. Tip: Place the beef in the freezer for 20 minutes before slicing to make it easier to slice thinly! Note: I like to go with a strip loin steak or a rib eye steak and flank steak cut against the grain is also great! Option: Garnish with beni shoga (pickled ginger). Option: Garnish with shichimi togarashi (seven-flavor chili pepper) or chili powder and sesame seeds to taste. Option: Cook the rice in a rice cooker! Option: Add extras like sliced shiitake mushrooms, green peppers, peas, spinach, shredded carrots etc. Option: Add eggs! Either top with poached or fried eggs or add eggs to the beef, onions, and broth, and simmer until the eggs are just cooked, about 1-2 minutes. I use a konbu (kelp) and katsuobushi (bonito (dried, fermented, smoked shipjack tuna) flakes) based dashi. Is there a way to make this without seafood products? I don’t mind dashi, but my sister can’t stand anything ocean related (weird I know)! Anonymous: You could easily replace the dashi with beef stock or a shiitake mushroom based dashi. Sounds good, think I will put that on my to try list. Bought some shrimp, on special at my local Zehrs, 14 oz. for $6.00 to use in a shrimp and asparagus dish I published yesterday. Kevin, if I want to add the mushrooms, should I saute' them in a different pan and then add them to the steak? Terry Edwards: Typically this is a quick and easy dish where everything is braised/cooked in the simmering sauce so you would add the sliced mushrooms along with the onions and the broth to cook. But, You could saute the mushrooms and onions in oil before adding the broth! Enjoy!